FILE - A civilian vigilante carries a bow and arrow while patrolling with the Cameroonian military in Kerawa, Cameroon, March 16, 2016. Cameroon has been arresting or dismissing members of local self-defense militia in the country's north amid fears that Boko Haram may be trying to turn some of them against their communities. Local authorities told VOA the crackdown follows an investigation by security agencies. Midjiyawa Bakari, governor of the Far North region, expressed concern that Boko Haram militants may be trying to infiltrate Cameroon via the local self-defense groups. Authorities are screening the groups, Bakari said. He added that authorities are organizing self-defense groups so, going forward, they'll coordinate with security forces and denounce suspects. Bakari did not say how many of the vigilante group members had been arrested. But local newspapers report that at least 70 have been picked up by the police in a dozen border villages and that the crackdown is still on going. Authorities did not offer any examples of this alleged cooperation between self-defense group members and Boko Haram and whether it has contributed to any specific attacks. Last month, Amnesty International accused Cameroon of arbitrary arrests and human rights abuses against suspected Boko Haram supporters. Amnesty said more than 100 people have been sentenced to death since July 2015 in trials it described as "deeply unfair." The government slammed the Amnesty report as biased. Abdoul Garba, who leads a self-defense group in Kolofata on Cameroon's northern border with Nigeria, says the insurgents promise better conditions and deceive some vigilantes to work as spies. 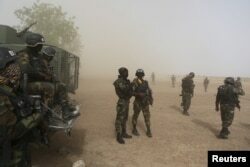 FILE - Cameroonian soldiers stand guard amidst dust kicked up by a helicopter in Kolofata, Cameroon, March 16, 2016. Part of a multinational force, the soldiers have intensified their fight against Boko Haram militants. Garba said the government should give the self-defense groups food and material to boost their morale. That would improve working conditions and spur volunteers to work as the government expected, he added. Self-defense groups say they've helped the military by patrolling villages and hard-to-reach border areas, but say they need more training for the hard, dangerous work. Inoussa Hama, a member of a Kolofata self-defense group, said some of his men had been kidnapped and killed. He said they need special instruction to handle overnight shifts from 9 p.m. to 4 a.m.
Cameroon authorities said they've reduced the terrorists’ ability to organize large-scale attacks but that the terrorists are trying to replenish their ranks by recruiting vulnerable youths in Cameroon.